Have you had any miracles in your life? (Kids are a given.) Just enough change for tolls? Just enough gas to get you to the station? Been tragically late for a flight only to find the flight was even more tragically delayed? Nothing is too small - share your miracles with us! About a year (and one month ago) on the cusp of a job change, if everyone will recall, I gave a news update about my near miss with a situation that could have gone very, very bad. When my friend and I were on the way home, in the middle of the night, a deer had shot out into the middle of the highway, and my SUV slammed right into it. Just the fact that we both made out it unharmed, with only my car taking the brunt of the damage, in honesty, I feel like was a big miracle. If I hadn't been driving slower than the speed limit because of the dark; if I had tried to swerve instead of just hitting the breaks; if my car had not been an SUV, and had been a smaller, less durable car... There were just so many factors that, looking back, could have worked against us. But they didn't, and instead, I am thankful everyday that there were so many factors of that night that kept us from a worse fate. This is only one of few miracles, but probably the one that affected me the most as a personal experience. But lately, I keep noticing other things that I might call miracles as well, whether big or small. As I work at a hospital that specializes in cardiology as well as regular open-heart surgeries, I feel like it's a big miracle each time a patient comes out of the OR and is able to stabilize and get better. Especially when some patients end up in surgery, start going bad, and manage to pull through after hours of post-op recovery work. Meanwhile, a couple incidents in my own personal life have occurred the past year that are of note. My mother had been having some strange stomach discomfort, causing a slight bump in her lower abdomen each night, something she only really noticed when she went to bed. My mom isn't really one to see a doctor all that often. She prefers to just let things play out because she doesn't like being bothered with doctor's visits. But after I had a brief health scare involving prolonged abnormal vaginal bleeding that lead to the discovery of a benign polyp, she's been super vigilant about everyone's health. So without having to be convinced, she immediately made an appointment to see a doctor who proceeded to just have her do an abdominal ultrasound wherein they discovered two things: 1) My mother's stomach discomfort was the result of eating too much, as well as eating things that don't digest well, while the slight bump was just bowel movement that was more prominent because she's too thin; 2) Mom might have gallstones. While I still don't like the non-diagnosis of the slight bump, the doctor says she's done all the examinations and nothing seems to be amiss with Mom's lower abdomen. In fact, it had been the gallstones she was worried about. So Mom got sent to a specialist with the possibility of having to have surgery to remove her gallbladder. Needless to say, no one was happy about that diagnosis either. Even though the procedure is said to be pretty simple, it is still surgery, and the removal of the gallbladder would be a huge life change for Mom. We were all worried. Fortunately, after seeing the surgeon, Mom was extremely happy to hear her say, "Keep your gallbladder and keep your stones. You won't need surgery." Basically, she really just needs to watch what she eats, and as long as the gallstones weren't going to obstruct any ducts, they were eventually go away and she'd be fine. But no more really oily or greasy foods--fewer french fries and lay off the fried chicken. We just need to help Mom watch her diet, and Mom needs to say something if there's any pain or discomfort. Most recently, our family heard from my uncle who lives in Australia with his family--my aunt and three cousins. One of my cousins was in a motorcycle accident. He was hit by a car on Halloween night and thrown from his bike. He ended up in the hospital with a broken leg, as well as needing a skin graft to his knee area. We'd all been exchanging messages online for a few days before hearing that he'd be fine and would be starting physical therapy soon. The most recent exchange from his elder sister about a week ago told us that everyone is relieved, he's out of the hospital, and he's "zipping around on his crutches." While I'm happy that he's fine, it doesn't escape my notice that motorcycle accidents can be dangerously fatal. The fact that he got out of it with just a broken leg, I believe, is a big miracle in itself. I can imagine how relieved his family must be feeling, as the rest of us were waiting daily for updates on his condition from across the world. It was a scary situation that I'm extremely glad hadn't been worse. And things like this really make you truly thankful for the miracles in life, big or small. Light 9 candles each representing something you’re thankful for (share a picture with us; sharing anything else is optional). I'm in need of at least seven more candles to complete this task. A bit of shopping might be in order. Have a donut – and let us share it via a photo. Homemade donuts and shared recipes encouraged … but any donut will do just fine. I honestly don't really go for donuts as a sweet snack or anything--yeah, I know, the nerve. But if I DO ever eat a donut, it's usually a cake donut, or the Krispy Kreme original glazed donuts. 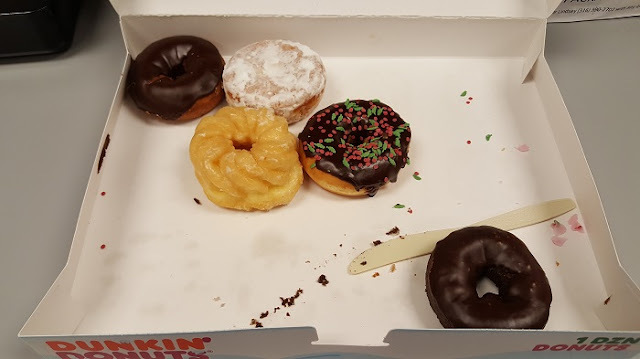 When I got to work earlier in the day, there were a box of half-eaten donuts that I was tempted by. Unfortunately, I didn't get a great picture of the donut I chose, but here's a picture of the box of half-eaten donuts. I took this picture to show one of my coworkers when I got to the lab, as the donuts weren't in our area, but in the front room of the offices, free for all. My coworker wanted me to tell her what kinds of donuts there were, so I just took a picture for simplicity. I'd forgotten that I had this and was quite upset that I forgot to take a picture of my chosen donut, by itself. But hey, this works too, right? A miracle crucial to Hanukkah is the Miracle of the cruse of oil, which concerns a jug of oil that (ostensibly) only contained enough oil for a single day, but miraculously turned out to last all of eight days. – Miracles aside, tell us: Have you ever experienced that something you had bought or you owned lasted a lot longer than anticipated … or where you expected a shortage which then fortuitously didn’t occur after all? The only thing I can think of would be some of the various supplies we utilize in the hospital lab. I was recently put in charge of inventory and supply ordering. And one of the things that had me freaked out a few months back are these big, five gallon containers of high purity, reagent grade water that we use for one of our instruments. When items are on back order, it is a nightmare, and this particular item ended up on back order for at least a month, and even with my conviction that we only went through one box each week, anything was bound to happen, and we only had a couple boxes left of this water. And back order dates are notorious for being inaccurate, and in this particular instance, the back order had gotten pushed back an extra week. Fortunately, either we were running fewer tests or there was some miracle, we managed to hold out until one of my orders finally came in. Meanwhile, I'd already been making inquiries and arrangements to find a possible back up or replacement. On a more personal note, does anyone ever find that their conditioner seems to never run out? I think I've been able get through one bottle of my Loreal Ever Creme Conditioner versus at least two and a half, or even three bottles, of shampoo of any brand. Read a book about light, miracles, characters who are Jewish or books set in Israel. 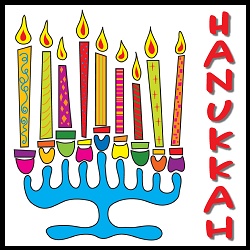 OR: Hanukkah commemorates the re-dedication of the second temple in the second century; read the second book in a series or a book with the word “second” or “two” in the title. I chose to retroactively claim Midnight Blue-Light Special by Seanan McGuire when this door was first revealed. 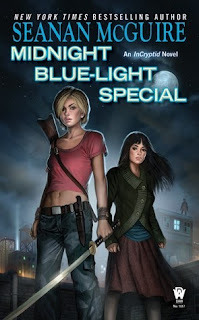 As the second book in the InCryptid series that I finished reading in November, it fits right in for this task.